In case you haven’t read the book by Og Mandino, “The Greatest Salesman In The World”, there is a chapter that helps one deal with the inevitable growth of a man’s ego. In order to keep the male ego in check (and this is not to presume that this is only a challenge for men, although usually more profound), the author attempts to put into perspective the human ability to change his environment. 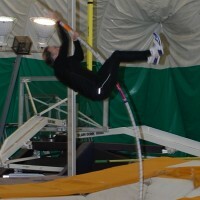 In so doing, Mr. Mandino states that one way to gain proper perspective is for one to ponder, “When I am Feeling All Powerful, I Will Try to Stop the Wind”. I am certain that none of us has reached the point to be capable of such a feat, and I would further suggest that none of us can control the temperature either. How is it that on the very day of an event called the January Thaw, the outdoor temperatures plummet below ZERO? Well, rather than try to figure that out, or worse yet, try to take control over the weather, I will submit to you that GOD has a wonderful sense of humor. Regardless of the frigid temperature outside the SEFCU Arena @ UAlbany, inside the record setting performances were burning up the record books. 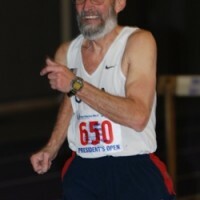 Okay…I will admit that this was the 1st Annual January Thaw, so every 1st Place Finish became the record standard until the next January Thaw, but we have to begin somewhere. 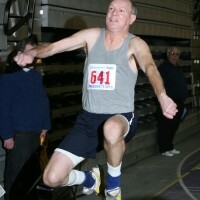 Jumping immediately into the Records was jumper Fred Clark (Pictured Above), who set the Master’s Men (55-59) Long Jump record with a leap of 4.34m. 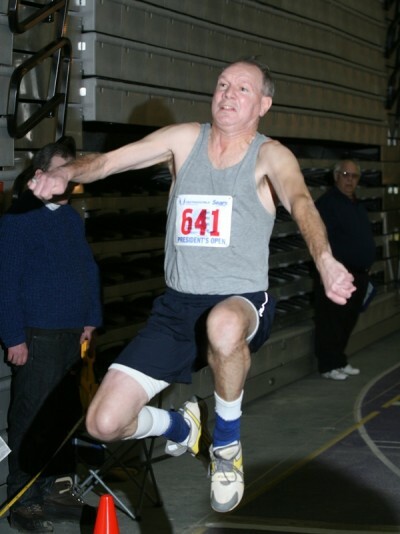 Fred just missed taking the top spot in the Triple Jump by only .09m, finishing 2nd to his friend (not his brother) Jim Clark. 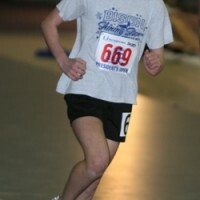 Due to lighting challenges inside the Arena, there were some photos that did not turn out as well as we would like, so they could not be posted in this article, and some of those were from the 55m Frosty Freeze Run. 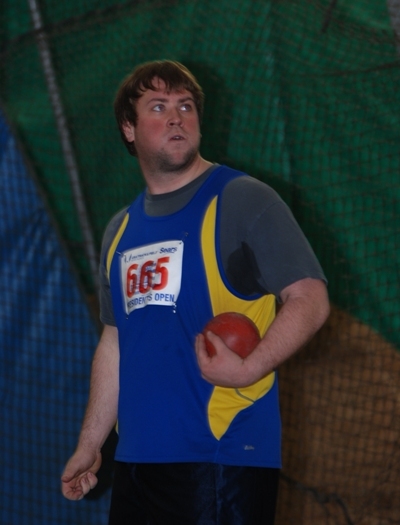 However, if you scroll down, you will have a chance to enjoy some of the top performances of the day…but you may want to grab a blanket before you do. 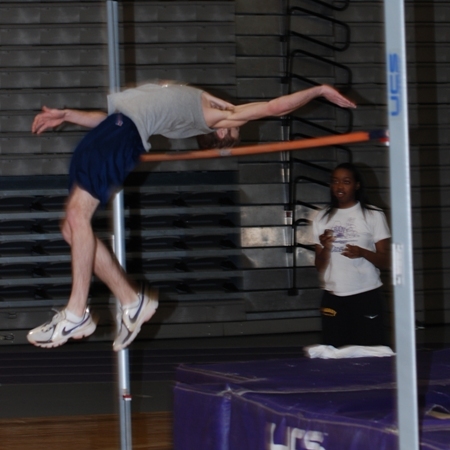 Leaping into the Record Books in the Open Men’s High Jump is Jared Bafaro clearing a height of 1.85m. 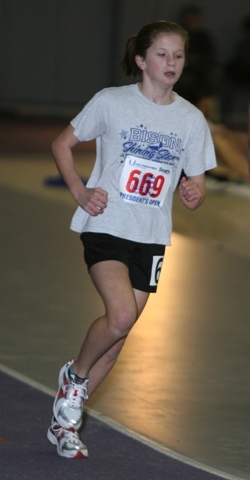 Setting the January Thaw Record in the Midget Girl’s 3000m Run is Payton Czupil with a time of 12:30.52. 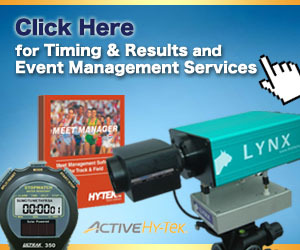 Where would Youth Athletes be if it were not for the help and support of Parents? 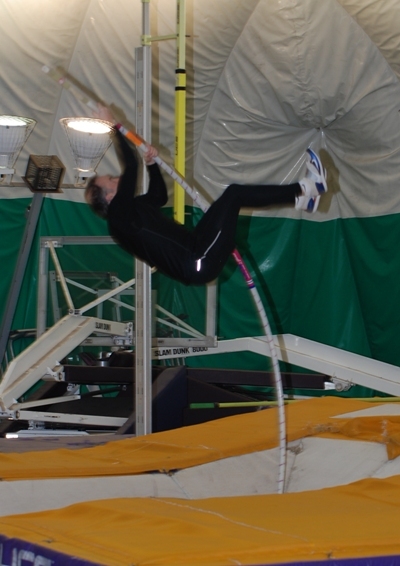 Wayne Bequette defies gravity and perhaps age, as he sets the Master’s Mens (50-54) Pole Vault Record rising to the height of 2.77m. 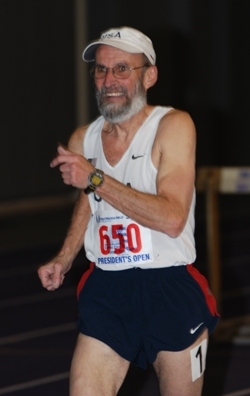 Probably the most consistent attendee at the Liberty Tour and Winter Express events, Michael Rosenthal sets the 1500 Racewalk record in the Master’s Mens (65-69) division with a time of 9:08.01. 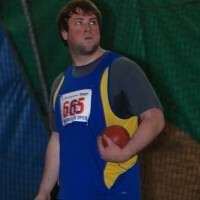 John Rudd didn’t just look to set a Record in the Open Men’s Shot Put, he actually toosed the iron ball 14m to do so.